Water your lawn or garden during the cool morning hours, as opposed to midday, to reduce evaporation. Use an automatic timer on your sprinkler or set a kitchen timer to remind you to turn off the water. 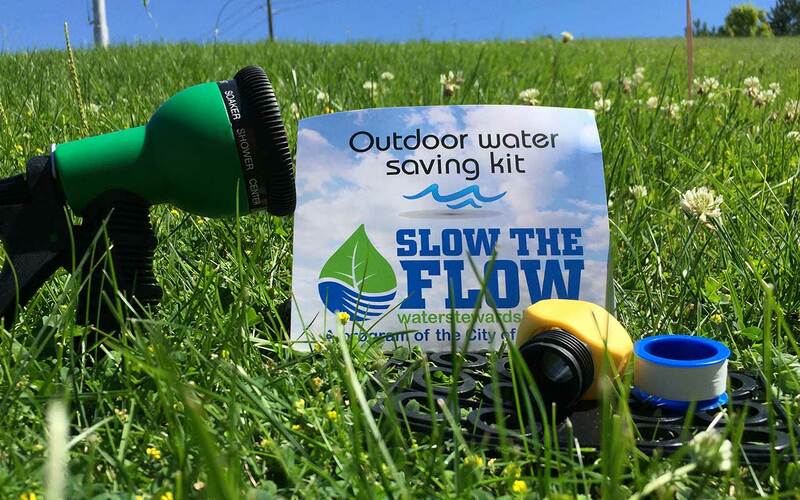 Left unattended, a garden hose can waste as much as 600 gallons of water in just one hour! Raise your lawn mower blade to at least 3 inches. Taller grass promotes deeper roots, shades the root system, and holds soil moisture better than a closely cropped lawn. Don't over fertilize. You will increase the lawn's need for water. Inspect irrigation systems and fix leaks and broken or clogged sprinkler heads. A broken sprinkler can waste 25,000 gallons in 6 months! Make sure you're watering the yard and not the street or driveway. 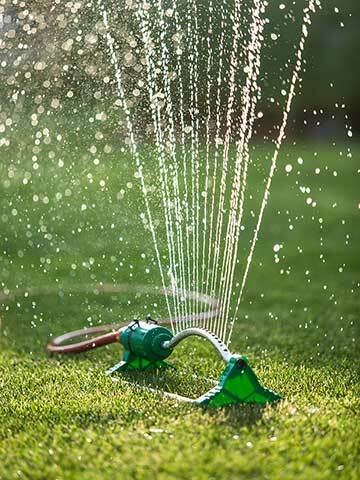 Lawns only need watering every 3 to 5 days in the summer. Watering more than 1 inch per week means you're just watering the ground below. Look for sprinklers that produce droplets or use a soaker hose to water trees and shrubs. One of the easiest ways to save water is to make sure that you are not overwatering your lawn and plants. Most of us water more than we need to, which not only wastes water but ends up drowning our plants. According to numerous studies, a healthy lawn needs only about 1 inch of rain per week. When using a sprinkler system or hose, that's the equivalent of 60 gallons per 100 square feet. Watering a garden is a little more complicated because the amount of moisture needed by vegetables, fruits and flowers varies, and these plants are more sensitive to heat. The “one-inch-per-week” guideline generally applies with a few modifications. When the weather is hot, it is recommended that ½ inch is added per week for every 10 degrees that the average daily temperature exceeds 60 degrees. Always water your lawn or garden during the cool morning hours, as opposed to midday, to reduce evaporation. Soil type is also a factor. Since sandy soils drain faster, they require more water than other soil types. In most cases, a deep watering twice a week is sufficient once the plants are established. If the soil is moist at a depth of 6 inches, this is ideal. Drip irrigation is the slow, precise application of water directly to the plants' root. A drip irrigation, micro-irrigation, system can be customized to meet your landscape's specific needs while maintaining an optimum moisture level for your plants, efficiently conserving water that might otherwise be lost. Drip irrigation is an efficient and economical method of watering. Experts say that drip irrigation is at least 90 percent more efficient than other irrigation methods and reduces runoff and evaporation. Drip irrigation applies the water slowly where it is needed—at the plant's roots. Commonly used in commercial nursery and agricultural operations, homeowners are beginning to take advantage of its uses and benefits. Did you know 1" of rain yields approximately 600 gallons of water per every 1,000 square foot of roof space?! With a rain barrel you can capture that rain and reuse it to feed plants with nutrient-dense water, save money on your water bill and reduce harmful urban run-off that would otherwise pollute our watershed and river. 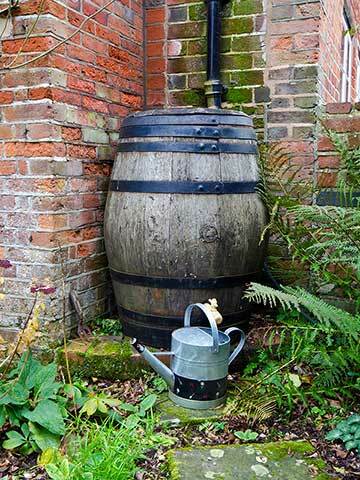 Installing a rain barrel is inexpensive and easy. View our guide to learn more. Is rain water harvesting legal in Washington? Yes! Under Washington State policy, property owners don't have to acquire a water right permit to collect rainwater. Learn more about state policies on rainwater collection from the Department of Ecology. 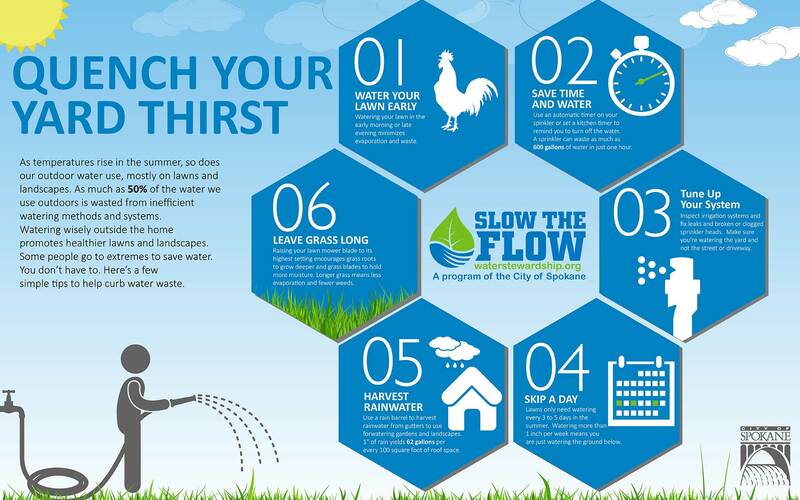 Whether adding a few plants or redesigning your entire yard, incorporate a Waterwise design to save water, time and money. 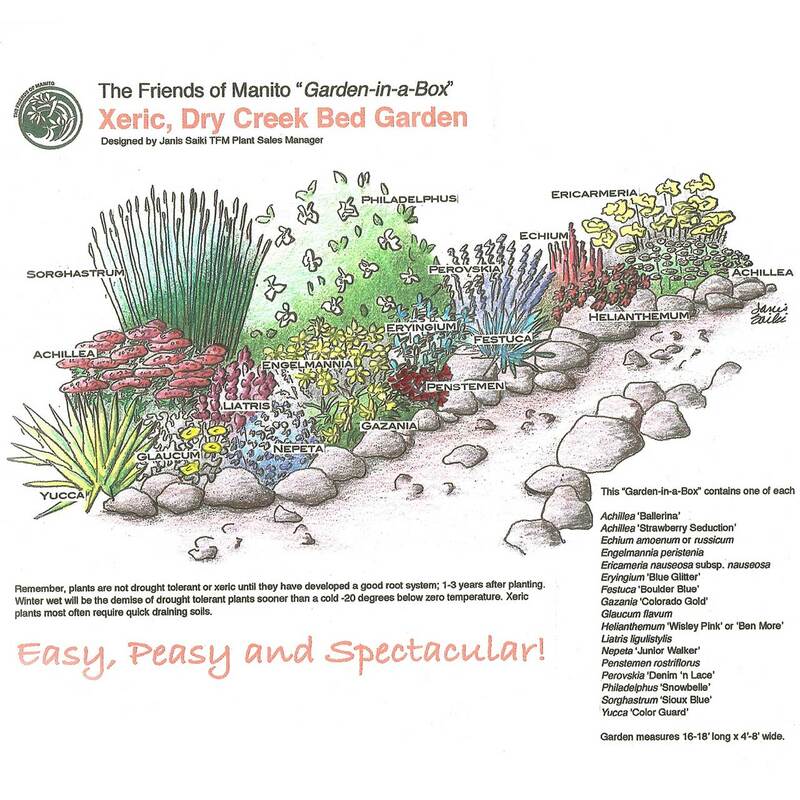 Xeriscape is a type of landscaping that reduces water use and incorporates native and drought tolerant planting. It also requires very little maintenance. Native plants only require trimming a few times a year and a basic treatment for weeds in spring time. Consider removing your turf and replacing with a “No-Mow” design using groundcovers, clover, ornamental grasses, native flowers and shrubs. These are all low-water use and low-maintenance! For even less maintenance, consider artificial grass. A number of manufacturers have developed versions that aren't easy to distinguish from the real thing. Once established, these plants require little water beyond what Mother Nature provides. The WSU Extension Office has comprehensive lists of native and drought tolerant plants, shrubs and trees.